It starts with a physical therapy plan. An accurate time frame for healing and a time frame for strengthening is essential to match your expectations to your goals. Once we have an agreed plan of action for your therapy, reaching success is just part of the process. You will be provided with all the tools necessary to achieve your goals including progressive home exercises and a progression of exercises that will keep you challenged from your first visit through to your date of goal achievement which will be the beginning of your freedom from therapy and the start of your post injury active lifestyle. Post surgical conditions all joints including wrist and hand, tendonitis, tennis/golfers elbow, plantar fasciitis, ankle sprains, balance training, fall risk, deconditioning, gross weakness, post fractures. 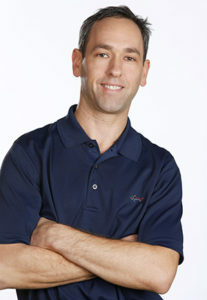 Steven Login, MS, PT is the founder of Proactive Physical Therapy, co-founder of Golf & Body, LLC and Golf & Body NYC. Proactive Physical Therapy provides a unique service to the Huntington Village community with insurance based manual physical therapy and golf simulators for golf performance and rehabilitation. Physical Therapy provides a comprehensive and effective means for repairing, rebuilding and strengthening patients of all ages and abilities. Steven uses a unique combination of manual therapy, functional training methods and whole body assessment to achieve superior results post injury and post surgically. Steven’s background as a collegiate gymnast supports his emphasis on posture re-education, body alignment awareness and full body mobility in treating all patients. Steven holds a Masters Degree in Physical Therapy from Simmons College, Boston 1994 and a B.S. in Exercise Physiology from the University of Massachusetts, Amherst, 1990. His certifications include Full Body Certified in Active Release Technique, Certified Advanced Thai Yoga Bodywork and is a Titleist Performance Institute (TPI) Certified Level 3 Golf Fitness Instructor and is trained in Golf Biomechanics by TPI. Steven has worked with Metropolitan Section golfers and teaching professionals since 2000, providing rehabilitation and advanced stretching and golf fitness for in-season management as well as off-season preparation and rehab. Community outreach and partnerships with local charities and organizations are a key objective in the growing business model for our Huntington location. We value our local merchants and seek to make it our business to strengthen and support the community we live and work in.